But yes, there are Permaculture people doing much more clever land-sharing agreements than SPIN. Also, don't pay that fortunre to buy that SPIN book, sheesh... much better info on the topic out there for much less $$$. That's my .02. Thanks for sharing, helpful video and thread. Many of the tasks I do have to be measured by the hour. I use a flexible scale for the various tasks I end up doing on a diverse homestead operation, with minimum rate of $30/hour. Many things pay a much higher rate, but if they don't pay at least that, then they're not worth my time. My target average is $50/hour. Plus, I don't like managing volunteers or employees, so I'd want to pay myself a much higher "managerial rate" for that kind of work. $100/hour might be worth it. Many farms I've worked on, the farmers essentially fall into being managers but pay themselves $5/hour (or less) for doing managerial work and pay their employees three times that for walking around poorly zoned farms half the day. And I count every hour. Doing that kind of math means we've evolved toward a lucrative living with the land as we gradually put more energy into efforts with a better ROI and cut out activities that never paid for themselves. It's also meant I spend more of my time doing stuff I actually like, rather than stuff I don't like. Follow the money and really quickly you figure out what's a viable full time living (or what meets your own needs) and what's hobby farming. Not only does valuing my work that way help me obtain a yield and keep the good work going, but i've also found it makes my Permaculture activism more effective, as I focus more on products and services that people actually want enough to pay for, instead of what my inner hippie THINKS they should be donating money to support. "Taking a stab at a known problem" is what defines the cooperative work of communities, such as scientific communities. It's not yet often done in our community, so it deserves thanks. The other part is having a community that is both supportive, but can provide impartial feedback. I agree that it requires work to become valuable for applications, but I'll keep it in mind, too. One last thought as I re-read through the comments here. "Patterns-to-details" systems can be tested, but create de-centralized, self-organizing structures to propagate themselves. Anyone can take the "tree, nitrogen fixer, mulch-maker, pollinator, etc." model of a guild and apply it in nearly infinite ways. They can "apply self regulation and accept feedback," tweak their plantings, then come back to this forum, or to their local Permaculture meetup and report on their results. It's a "free" system that doesn't cost our community anything to maintain. When we create such a tool, we've "caught and stored" our intellectual work into a Permanant, self-maintaining tool, a bit of "culture." Bill Mollison's classifications would call such a thing a "regenerative" or "procreative asset." It's Perennial. A data-base of specific plantings sounds like it requires a host, an organization, meetings, continued research and testing.... all things that require ongoing inputs of capital and energy to keep going. Such systems are like "annual agriculture" in that way. In Mollison's terms, they are "degenerative assets" that either break down or require continuous inputs. Just thinking out loud. Clearly, you're freakin' brilliant. I hope you'll keep us informed of your thinking and work! Wow, very impressive, thank you! Now, I want to do you the unpleasant favor of subjecting your work to ruthless, impartial scrutiny. 1. Your stated goal is a system that's "descriptive" rather than prescriptive. 2. Descriptions of such systems could be useful for research, for example, on pest issues. I'd like to hear an example of how this could be useful for research and what that research process would look like. I agree that such a system would not be useful for prescriptive practice, since sites vary so much. One of the Permaculture principles I find very helpful is "go from patterns to details." Many of the useful Permaculture tools, such as "guilds" and "forest gardens" follow this principle, which yields us practical, simple tools to use. It's hard for me to envision the utility of a system that starts with specifics. For example, utilizing the diversity/resilience theory in ecology is a "patterns to details" tool that helps us act very practically to control pest and disease problems by increasing plant diversity and incluing habitat. It is also elegant and testable, in that diverse systems can be tested and compared to monoculture systems. Next, the Permaculture systems and the traditional forest gardening systems (such as hedgerows and tropical home gardens) I most admire and wish to emulate tend to be very complex. It seems like it would be very difficult to describe any of these using such a system. It would be impossible to describe my own forest garden in this way. To describe Martin Crawford's garden, you would have to define arbitrary "bounds" as you suggested in your example. That means that there would always be significant outside factors having an unmeasured influence on research. 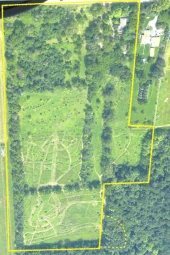 For example, pest resilience research on one arbitrary "patch" of Crawford's garden could be strongly influenced by species present nearby but outside the test "patch." I see more potential value with very simplified commercial Agroforest systems, but since these systems are so varied, and currently in a phase of experimentation (and hence diversification,) it would be tough to cobble together enough data points on any one type of described system to conduct meaningful research. As a final thought, we use a similar system for describing "native" ecologies in the US, but that system is inherently flawed by the assumption that these were "naturally occurring" ecologies, and that Native Americans lived "transparently on the land" without effecting their ecologies. As such, I've never seen this system used to describe the "wild" naturally occuring "recombinant ecologies" that occur in my biome, which are the most interesting to me in designing polycultures. I have often suspected it would not be useful in such a context in my biome. Detailed Schedule is now up! Heavy on advanced topics, representing a lot of experience on homesteading, market gardening, and social Permaculture. This should be a great weekend of learning, networking and inspiration. Hope to see some of y'all there. The SoMi Perma-mixer is the place for Permies to connect, share labor, and break-bread at permaculture sites and projects throughout southern Michigan: fun, inspiration, information, entertainment, and good food. All Permaculture, all the time. 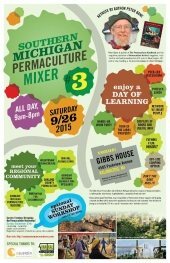 This third mixer will be held at the Gibbs House Permaculture site on Western Michigan University's campus in Kalamazoo, which features a market garden, hoop-houses, hugelkulture beds, a young food forest and more! Permaculture legend Peter Bane, long-time publisher of Permaculture Activist Magazine will be giving a Keynote and there will be many other opportunities for discussion and inspiration. Peter will also be joining us on Sunday the 27th for a special "companion class." See below for more information. REGISTRATION REQUIRED. Due to parking and site constraints, space for this event will be limited. So register now to reserve your spot! 8:00 AM: Site Opens, Coffee. 9:00 AM: Commencement, introductions and site tours. 11:00 AM: KEYNOTE: PETER BANE. 12:30 - 1:30 Potluck Lunch, see registration below. 2:00 PM: Workshop and Instructions: Educational work event, "Permablitz." 5:00 Formal end, poster break-down, etc. 6:00 Dinner: Provided by "the Campus Beet," suggested donation $5. 7:00: evening activities, music, fire, discussion. 8:00 PM: Screening, "Inhabit" a film about Permaculture. A dinner featuring local produce will be provided by the Campus Beet. Suggested donation $5. Details TBD. "Long-term economic contraction is well advanced, and Michiganders are in the forefront of adaptation to it, but permaculture brings a powerful lens to developing resilient home economies that can enhance the well-being of people on every rung of the economic ladder. How can we create economic value when money is scarce, build natural and social capital for long-term prosperity, and create and occupy new niches in the emerging subsistence economy? We will look at the patterns, structures, systems, and practices that promote comfort and security for the home and homestead. This workshop, appropriate for rural, suburban, or urban dwellers, will cover the role of food, water, shelter, energy, and exchange in providing support for the family table. In doing so, we will touch on gardens, food storage, home work spaces, building rehab, and a host of technical approaches to water, waste, and energy. We will also examine the role of support networks in creating autonomous spaces amidst the decay of empire. We will undertake design exercises to strengthen our capacity to create resilient homesteads and to weave our own social and economic safety nets." Hi folks, very interested in swales! Given the comments about "leg breaking" I'm starting to think that a trencher might be more trouble than it's worth. As far as calculating size, most of folks I know have just used intuition, but there are a lot of tools out there to help you do the math. Usually, people just dig them, and then "accept feedback" if they got it wrong. If the swale is too small, it can "blow out" and sometimes take plants with it, or cause significant damage to a crop. On the other side, I've seen folks dig too deep, and either destroy the landscape hydrology that their young trees needed to survive the first few years, so that they would have been better not to dig any at all. I've also seen a few examples of swales way too deep that instead become permanent ponds. In my opinion, they should be as small as possible and still do the trick. We used tools like this to size our swales and they turned out much, much smaller--almost imperceptible--than they would have if I had just guessed. I've observed them in very heavy rains and never seen them fill close to overflowing. So, IMO, it's worth the time to do the math. Yes, plant them! They produce ridiculous amounts of carbonaceous material for compost and mulching. They quickly fill in woody hedges until the woody plants get big. They're beautiful. We get comments on our Sunchoke flowers all the time. It takes experimentation, but they make great dumplings with a little egg, flour and water. Or try a "curried Sunchoke" or "roasted garlic sunchoke" Veloute. The texture will be smoother and sweeter than good potato soup. Just wash between the folds first.